Beautifully illustrated and vividly retold with join-in actions, this Noah's Ark storybook features a sturdy carry-along handle. Ages 2-4. 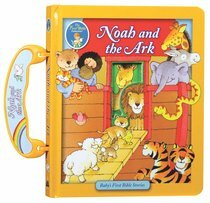 About "Baby's First Bible: Noah and the Ark (Handle)"
Young children will love carrying around this little Bible story classic - part of the best-selling Baby's First Bible Collection. Beautifully illustrated and vividly retold, this book features a sturdy carry-along handle. Each part of the story is accompanied by a join-in action to get children involved. Don't be surprised if children take this book everywhere they go. It's made to travel and treasure!